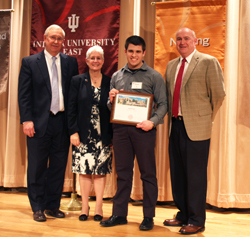 Indiana University East celebrated the accomplishments of its students during the annual Honors Convocation held April 24. Thomas (Toby) Bonwell, Dublin, Ind. Mellissa Elmore, New Castle, Ind. 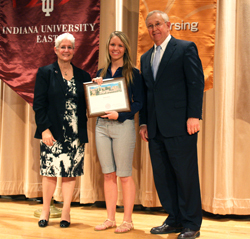 Kasey Stolle, Richmond, Ind., is the Naomi Osborne Scholar. The award is given to the baccalaureate candidate with the highest grade point average. Stolle will receive her Bachelor of Science in Biology. She has been accepted to the IU School of Optometry.